I got my GSO in the mail the other day and was very excited to get it all set up and cooking. I got it all set up and figured that I would just try something simple to make sure the critter does its job. So, I pointed it twards the sun and walked away. Came to check on it 15 minutes later and the puppy was at 200 degrees! Wow! That was quick! So I walked away again and came back to check on it after another half hour- just to see what we where sitting at...then I realized, that the temp had dropped due to the haze over the sun. So I sat and scratched my head for a bit and put it away. Next day i set it back up in the morning rays and watched it rise up to about 250, put in some vinegar water to steam clean it and walked away again. After about 45 minutes, and moving to meet with the sun, I had a nice, steamy oven. The haze came back and it didn't get much over 250 due to the fact that it wasn't collecting raw sun. I am a little frustrated, but hopefully I will get more sun to be able to actually bake in it soon. If you have any pointers for me that would be great! I am very enthusiastic about using my sun oven, but I think that there is a trick that I haven't figured out about cooking with clouds. I'm sure I will figure it out, and when I do, you will be the first to know. On some days timing and what you cook in your solar cooker is key. Here in the Desert Southwest we have challenges with the summer time monsoon season and so we battle clouds all the time with our daily solar cooking. Some days will start out cloudy and clear up for the most part and others will start clear and cloud up by early to mid afternoon. Some days I have to just go with something that will cook quickly and does not require much prep, and on other days I can cook foods for four to five hours time. With high think clouds you can almost always heat most foods, like soups, stews, chilis, burritos etc. without much problem, and to very hot temps. So, don't let it discourage you. ...If there are any others out there who would like to give their own suggestions and pointers, please do so. Do you seek a hot oven or hot food? 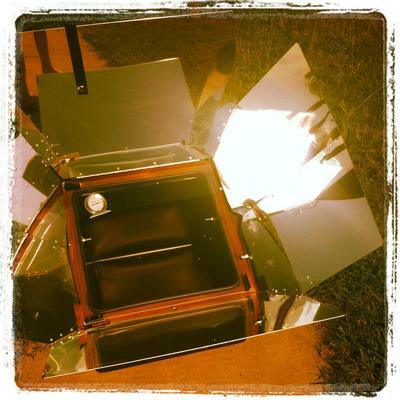 Converting to solar cooking involves rethinking temperature. Rather than measure the temp of your GSO, just try cooking in it. Hazy days will take a little longer, but anything over 200 degrees is very respectable cooking temp. Just baby step. Start with one cup of rice. Get used to the capability of your GSO. It is an excellent, reliable cooking appliance and you will have no problem with it. When you go to cooking meats, be sure to use a thermometer so that you know the meat is safely cooked.